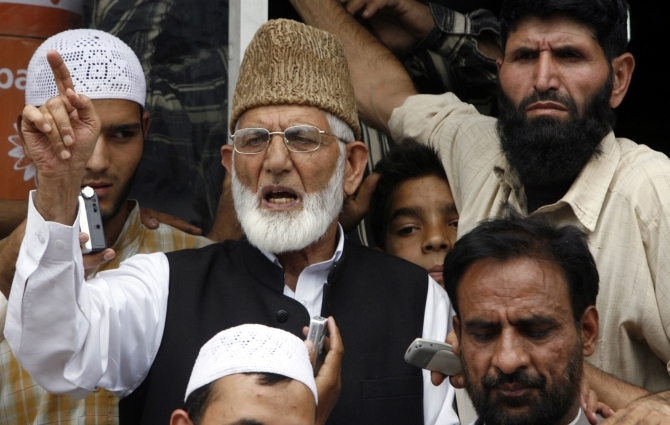 Seven people including Altaf Ahmed Shah, the son-in-law of hardline separatist leader Syed Ali Shah Geelani, were arrested on Monday by the National Investigation Agency in connection with its probe into the funding of terror and subversive activities in the Kashmir Valley, officials said. Shah, popularly known as Altaf Fantoosh, was in the custody of the Jammu and Kashmir Police, who had put him in preventive detention earlier this month. Besides him, Geelani’s close aides Ayaz Akbar, who is also spokesman of Tehreek-e-Hurriyat -- a hardline separatists organisation -- and Peer Saifullah were arrested by the NIA from the Valley, they said. The NIA also arrested Shahid-ul-Islam, spokesman of the moderate Hurriyat Conference led by Mirwaiz Umer Farooq, said the officials, engaged in the operation. The others arrested are Mehrajuddin Kalwal and Nayeem Khan (of the Hurriyat’s Geelani faction) and Farooq Ahmed Dar alias ‘Bitta Karate’, they said. The houses of those arrested had been raided by NIA sleuths last month. Shah is perceived as an influential force in the Tehrek-e-Hurriyat. Hafeez Saeed, the Pakistan-based chief of the Jamaat-ul Dawah, the front of the banned terrorists organisation Lashker-e-Tayiba, has been named in the FIR as an accused besides organisations such as the Hurriyat Conference (factions led by Geelani and Mirwaiz Farooq), Hizbul Mujahideen -- another terrorists outfit -- and Dukhtaran-e-Millat--an all-woman outfit of separatists. Those arrested have been brought to Delhi and will be produced before a court on Tuesday, the official said. The raids were part of the NIA’s efforts at clamping down on separatist groups allegedly receiving funds for subversive activities in the Valley. The NIA had registered a case on May 30 against the separatist and secessionist leaders, including members of the Hurriyat Conference, who have been acting in connivance with active militants of proscribed terrorist organisations HM, Dukhtaran-e-Millat, LeT and other outfits and gangs, an official release said. For the first time since the rise of militancy in Kashmir in the early 1990s, a central probe agency had carried out raids in connection with the funding of separatists.